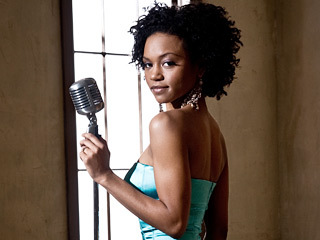 Most people remember Syesha Mercado from season seven of American Idol. With her rich vocals, trendy style, standout signature natural tresses, and a smile that could light up any room, her positive attitude towards life was evident even in just the short reel American Idol compiled as part of her aired audition. She told Ryan Seacrest that good things were coming her way because she was "attracting it just by being positive." Well since Idol, the 27-year-old Sarasota, Florida native, has attracted a lot more than just "good things." The stunning songstress widened her horizons, landing the lead role of Deena Jones in the international tour of Dreamgirls and later as the lead female, Ti Moune, in Once on This Island. The demanding work on Broadway allowed Syesha to draw on the valuable training she received while at Mantee School for the Arts and later as a theater major at Florida International University. But it also prepared her for opportunities ahead. Her interest in music was cultivated at a young age, influenced by her Mom, Zelda, a former Mowtown backup singer. Her mother's passion for music sparked Syesha's own love for the art, moving her to start singing in her church's choir. Years later, Syesha's passion for music, a voice that can rival the best of the best, and an outstanding work ethic, have paved her path, propelling her past just singing. She is currently making her mark as the lead female character, Nabulungi, on Broadway's The Book of Mormon. Also cast as the lead female character, Mia, in Dreams, Syesha is proving that when it comes to dreaming, the sky is the limit. The Joel Kapity film is set in urban Chicago and follows the inspirational struggles of four characters striving to realize their dreams. Syesha stars along veterans like Vickie Winans, Angie Stone, Mel Jackson, and Geoffrey Owens. A line in the movie's trailer says, "Dreams are not just some pivotal moment you accomplish 10 years from now. It's about today and what you do every day until you get there." And Syesha is doing a lot. What is the message of Dreams? I hope that after watching it the audience knows that anything is possible and that you can't let your past determine your future. My character, Mia, she is haunted by her past and she has a passion and a love for singing. She has a beautiful voice but she's so afraid because she's allowing her past to really have a hold on her. I want people to watch this and learn that when they can let go of the past and let go of all the bad things that try to come against you and where you're trying to go, you can really blossom and grow and get to somewhere that you've never dreamed of. We all have a past and have all been through things. But when you can let go of those things you can really move forward and accomplish your dreams and get there. Make it happen. How did you land the role of Mia? A lovely casting director called Phaedra Harris casted me in one of my first movies that I actually didn't end up doing, but she has always kept me in mind for future films, and this happened to be one of them. So she put my name in Marvin Winans' ear. He lived in Tampa at the time and I was in Tampa touring with Dreamgirls. So he came out to the show and after my show he said, 'Hey we want you as Mia." It was a blessing. What do you want viewers to see from you as Mia? I really hope they can feel what I brought to the role. I really did my best to pour my heart into it, and I hope that when people watch me they can feel the passion and commitment that I made while filming. How did your work in Dreamgirls prepare you for Dreams? I shot Dreams while I was doing Dreamgirls still so I had to take time off. I had two weeks to film. So it really taught me balance because when you're working and filming at the same time, that's a heavy workload so you're forced to balance. There's no choice, there's no complaining; no moaning about it. You just do what you have to do. The first scene that I did with Joel Kapity was my most emotional scene and I didn't really have time to think about it. I just had to do it, so I had to trust the work that I did prior to even getting the role. What was it like working with Joel Kapity? He is a faith-based director so before we shot every scene we would say a prayer. It was a very warm, inviting energy on the set because he is such a nice, warm, polite and respectful person. He just wanted to make sure that every person was taken care of and feeling good and doing okay. Joel did a great job at making the actors comfortable so that when we were shooting we didn't have anything else to worry about. It was a great feeling and it made everyone feel like we were family. Do you try to share your positivity in your music? With music, it's more so about what I want to say. I feel like when people create music, they create bodies of work, albums. They tour because they feel a strong need inside of them to get out what's inside. They have something to say. Sometimes it's positive, sometimes it's negative. Sometimes it's sad, sometimes it's happy. But it comes from somewhere. For me music is my therapy. and sometimes the things I have to say are very sad and sometimes they're very happy.I'm creating, not to show 'oh hey, I can do this or that." I'm creating because I need to. When someone listens to your music, what do you want them to hear? I want them to go on a journey with me and I want them to feel my heart and my soul. I’ll never forget the time that I saw A Star Is Born for the first time. I remember being so overwhelmed, I can’t even describe the feeling. I was weeping. I was crying I couldn’t stop. And we sat there just thinking, 'We have to do something like this. We have to do projects that bare our souls; that bare our hearts. That touch people, that move people like how we’re being moved right now.' So that‘s my goal when I create music, when I perform. It's to move people the same way my mother moved me when I saw her singing in church and I was very young. You feel their heart, you feel their soul. It’s just something that you can’t describe. It’s a feeling, it’s an aura that they have, and when you hear it, when you see it, you’re moved by it and you’re inspired to go out and do something great. It inspires greatness. And that ‘s what I want when people hear my music, when people see me in films, when people see me on Broadway. That's what I want. For people to be inspired and to be moved. To BE inspired to be great. Who's one person that inspired this in you? My mom for sure. There's a clip I posted on Youtube of her singing in church. Almost every night I would listen to that clip of my mom singing. I would listen to it before I go on stage because it takes me to a place that keeps me grounded and appreciative. It really moves me. It reminds me why I do what I do. What advice do you have to those aspiring artists out there? Patience. You have to have patience because there will be a lot of 'no's' and a lot of rejection. But you have to remember and know who you are. Know your talent, know your worth, know your value and keep pressing forward. Keep working hard because eventually you'll get there. What's the one word to describe your music? Soulful. It's not about the sound meaning you're doing vocal riffs and gymnastics, because I think Judy Garland has so much soul. Aretha Franklin even describes her as having a lot of soul. Soulful means that when you hear that person's voice you literally feel their soul. So yes, soulful. That's where it comes from. My soul. It comes from my soul.